Preheat oven to 375F. Roll pastry on floured surface into circle 1 inch larger than inverted 9-inch pie plate. Ease pastry into plate; trim and flute edge. Pierce side and bottom of pastry with tines of a fork. Bake 10 to 12 minutes or until lightly browned. Cool completely on wire rack. Meanwhile, beat cream cheese and Equal in mixing bowl on medium speed of mixer until smooth and well combined. Gradually mix in whipped topping, pineapple, 3 tablespoons coconut and rum extract. Place half of cream cheese mixture over pie crust. Arrange banana slices in single layer. Top with remaining cream cheese mixture. Sprinkle top of pie with remaining 1 tablespoon coconut and chopped pecans. 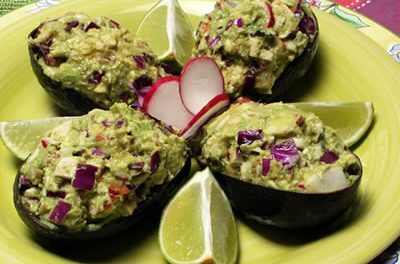 Refrigerate 2 to 3 hours before serving. 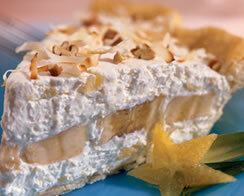 A pastry crust filled with sliced bananas layered between a fluffy mixture of reduced-fat cream cheese, pineapple, whipped topping and coconut.